PortEmber continues, still having too much fun! Hello and welcome back to the PortEmber challenge! We are continuing our series of John Porter graphics and Flash animations starring Richard Armitage. Today’s PortEmber challenge request comes from Musa/Fabo. She was first in the queue, but I’m not posting in any particular order. 🙂 Thanks for your lovely screencap choice, Musa/Fabo! The caption reads “You want my voice for your ringtone?” I made this into a cartoon look because Musa/Fabo suggested a humorous caption which I adapted to be shorter. Raise your hand if you’ve ever used RA’s voice for your ringtone! Raise your hand if you’ve at least considered using his voice, LOL! And finally, just for some Flash fun and games, I created an interactive project which is hosted on my external website. Please click the image or the text link below. Thanks for your visit and I’ll talk to you soon. This entry was posted in Animated GIFs, Graphics, richard armitage and tagged animated gifs, chris ryan, chris ryan's strike back, john porter, richard armitage, strike back, thanksgiving. Bookmark the permalink. 58 Responses to PortEmber continues, still having too much fun! PS : I have a RA ringtone for the sms : It’s “Isabella” (episode 5, “Robin Hood” season 3). And I loooove it… because it’s my name… It almost makes me swoon everthing I receive a message, lol. @Jael: Hee hee, I have a ringtone with John Porter’s voice but it’s set up so it’s only used when one of my friends calls me. 🙂 Good luck and have fun figuring it out! Excellent flash game. I vote that you add a bottle of massage oil! @Elaine: Hmm, I might need a password-protected R-rated version of my Flash games, LOL! Bccmee, you are a real gem!!!! @Julischka: LOL at your caption! I thought the combination of the gun with the flowers and engagement ring was pretty funny but you put it into words in a way I couldn’t! Thanks for your comment! You may be having a blast, but we are enjoying your TNT as well – thanks. As it is my dream to share a bowl of fresh strawberries & whipped cream w/ Mr Armitage out on our deck, I suppose I would like to see said bowl in one hand and a spoon in the other. If Mr. Armitage is too busy, I would settle for John Porter, considering he has been relieved of his duties as an SAS officer (I refuse to believe that JP is no longer w/ us. “Strike Back” died, not John Porter). @Kitty: LOL re: TNT! I can probably accommodate you in your request for strawberries. It might be awhile so don’t be shy about reminding me. 😀 Thanks for your comment! And I love how JP’s hand orientation changed for the gun. Way cool. However, with JP having at least one hand in the air–and reading about RA’s interest in dancing–I wouldn’t mind slipping my hand in his as we dance. Sighhhhh! @Gratiana: You’re very observant! I used 3 different hand/arm combinations in the Flash animation game. In the original screencap, JP is holding the phone but I changed the default to an outstretched hand, then the “phone hand” was used for the phone, engagement ring and flowers, then finally the hand holding the gun was from another image entirely which required color matching. @jazzbaby: It’s my pleasure! Thanks for you comment and support! words fail me…this is brill…the romantic fool I am, I chose the ring….swooon…oh but as usual my naughty side took over…what would I like him holding in his hand….the white towel…yeah!!! Yes, I would love your voice as my ring tone! That said, B, this is a fun gif. thanks Fabo, for the idea! @jeanniegisborne: I’m so delighted you enjoyed today’s challenge! Thanks very much for your comment! @Fred (@mondeencouleurs): Everyone should send you a tweet! Then you can hear that lovely voice …. *swoon*…. I also have it, lol. Thanks for selecting my screencap today Bccmee! Great caption too! I would be afraid to have JP as my ringtone, It might be too tempting for those around me who might hear him! Now, I’ll have to go and see what I want him holding in his hand? Hi BCC, Fabo’s suggestion is full of humor. @Carla: His facial expression makes the flowers or engagement ring funny! I would still accept either, LOL! Thank you, Musa, for choosing that scene and Bccmee for making such wonderful sequences and game !!! Why would any woman on earth steal the car without RA in it ? Ringtone, I must admit, I had thought about it, but do not play much with my mobile phone and so never got round to look into what format that would require. @CDoart: LOL! You’ve given this a lot of thought! Yes, what woman in her right mind would leave behind a gorgeous hunk of man like John Porter? Thanks for the laugh! @Tina: Hehe thanks again for all your support! You can find ringtones on some of the RA websites in case you didn’t know. 🙂 I’m more of a visual girl than an audio one. The gif is amazing! The game and siggie are also fabulous (I love all your siggies btw) but there’s something mesmerizing about seeing RA’s characters in motion in such a tiny little square. @Ana Cristina: How very cool that you have special ring tones and pictures on your phone! Isn’t it so much fun? LOL What a hardship! I had to watch it again to find this. It’s Ep. 6, near the beginning, in the scene where Sharq forces Gerry to put the gun to his own head, it’s the first thing Porter says in that ep. His voice is so deep and luscious I have it as my Windows log on, also. @Carolyn: *giggle* Thanks for letting me know! I am going to listen to that bit right now!!! Great FUN! Thanks for the suggestion Fabo! I so WISH I could custom make alarms on my iPod Touch – just think of the endless possibilities …. @Fanny/iz4blue: I just noticed there is a “buy” button but I don’t imagine they offer RA voices for their alarms on iPods! @Ania: I sometimes have RA character pictures on my phone and iPod, but the menu options cover his face, LOL! @Teuchter: Most newer phones allow distinct ringtones for certain people in your contacts. So if one of your RA friends calls you up, you can hear RA’s voice. If it’s a professional colleague, you can go with something more traditional and far less lovely, LOL! Thanks so much for your comment. We’re never too old to have fun!!! You are fantastic,bcc!Very original! But…Am I sleeping? How havent I´ RA voice as my ringstone? Thank you for the clue! I´m going alredy to figure it out Nice weekend! @Tereza: Have fun putting a Richard Armitage ringtone on your phone! 😀 Let us know which audio clip you choose. Thanks so much for your sweet comment! plane ticket to New Zealand with my name on it!!!!!! @tyme4t: Yes! The sunglasses did cross my mind but lack of time prevented me from including them. 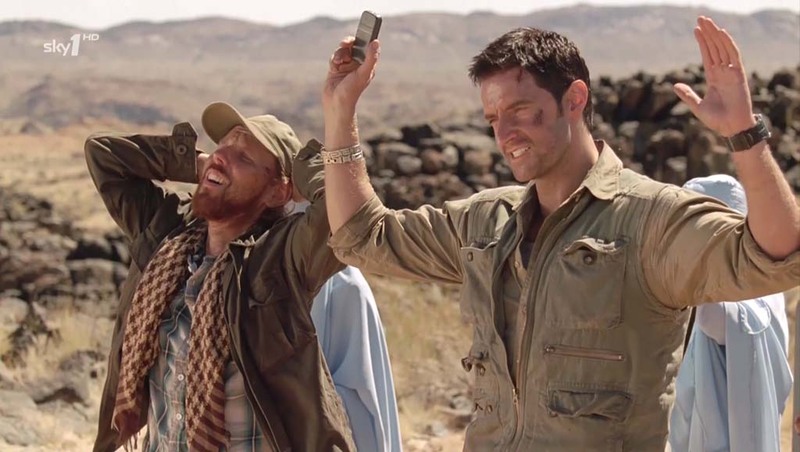 @chabesquen: I am sure you can figure out how to put a Richard Armitage ringtone on your phone. 🙂 How exciting that a Richard Armitage character says your name!